Where do we start with this amazing city? The fact that we went there twice in one trip because we loved it so much? The fact that we may never have been anywhere with so much energy and colour? The fact that we would go back again and again and again, yep and again? Some people dislike Rio de Janeiro and I understand why. It is intimidating, it’s in your face, it has a scary undercurrent which isn’t always far away, but in our opinion, it is worth a few eek moments to experience this wonder. The good outweighs the bad in its millions and we are so excited to share our experience with you. We arrived early in the morning just as the sun was rising and there was a hazy atmosphere around. We were staying at PortoBay Rio de Janerio which is right on the Copacabana sea front and the views from the roof-top pool are out of this world with Christ the Redeemer in one direction and Sugar Loaf Mountain in the other. We arrived just as breakfast was being laid and we were offered a glass of champagne (not even prosecco, champagne) at 7am, we knew instantly we were going to like it here. Our plan for day was simple, relax and relax a little more. Our biggest activity planned for the day was to move from the roof top pool at midday down to the beach, so we could experience the best of both worlds. Normally we’re out in force the first day we arrive, but after a stressful overnight flight via Paris relaxation was key. Not long after having finished a couple of glasses of champagne at breakfast we headed to the pool. Rio’s skyline, which was only going to improve and improve over the trip, was breath-taking. Like stare at it all day and not get bored at all breath-taking. The way the city is nestled between the hills and mountains is beautiful, topped off with the beaches and sea wiggling around the outside like a snake. But a nice snake. Now, the caipirinhas in the hotel were amazing but once your down on the beach with the street vendors you’re into a whole different ball game. They no longer come in a pretty little cut-glass tumbler with a solitary lime balanced on the rim carefully, but in plastic pint glasses with what we would estimate as five times the amount of cachaça. To say the least, they were intoxicating and after a long night of travelling we fell into a very deep sleep early in the evening. No Rio party vibes for us that evening. Much to our surprise we woke up with fresh heads early in the morning, again in absolute awe of the views outside of our bedroom window. We gave the champagne a miss at breakfast hoping for a more productive day and headed out in search of seeing our forth wonder of the world. Now, after seeing Petra, the Taj Mahal and the Colosseum we were doubtful as to why a statue was on the list. Petra, the Taj Mahal and the Colosseum are all imposing, beautiful buildings with a world of history behind them, in our eyes they are true wonders, so what was Christ the Redeemer doing in the gang? We got to the base of the mountain as soon as it opened, we had heard it can get extremely busy, so we wanted to be at the front of the queue. You can go later in the day and get tickets, but you might have a few hours wait for your time slot. Even though we were slightly dubious about its wonder status the big man is something we had wanted to see for years and years, so we grabbed our tickets and literally ran to the tram. There are many ways you can get there; hiking, driving, taxi or tram. We chose the tram as we had read it was an adventure in itself. People were not wrong. It scales the mountain side and for the most part when you look over the side you cannot see the track, it’s not an ultra-modern contraption like you find on Sugar Loaf Mountain, so there is a few jolts and slides, but it does make for an experience. However, if you do have a tremendous fear of heights or you are nerved easily maybe take a different path. Even though we were up early, it’s almost impossible to get him to yourself. But now we saw. Now we saw why he was a wonder and why he is part of the gang. It’s not only the statue itself, which is extremely impressive but also the setting. The view over the city from up there is awe inspiring and we thought the view from our hotel was good. We had a completely bluebird day and we think he planned it for us. We were up there for a couple of hours taking in all that we could. It was an absolute marvel and a huge, fat, bright red tick on our bucket list. If you see anything when you’re in Rio de Janeiro, this is it. Top Tip: Trying to get a picture with the big man is a nightmare, it’s literally double chin city. Therefore, the earlier you get here and the less people there are the better chance you have. Go to the steps half way down the strip and stand at the top while the other is at the bottom. Not perfect but the best you’ll get!! After genuinely one of the best mornings of our lives we were on to another lifelong dream destination, Santa Teresa and Escadaria Selaron. Santa Teresa is an arty district of Rio de Janeiro where you can find cute little shops, amazing food and a world of artistic graffiti. It’s a great place to grab a quick bite to eat and again the views over the residences snuggled between the lush, green vegetation is stunning. We ate at Espirito Santa and cannot recommend it enough, especially if you can get a table outside on the balcony. Once our bellies were full and after another round of caipirinhas (seriously they’re delicious) we were on our way to Escadaria Selaron. These tiled steps, better known as the Selaron Steps, are a magnificent work of art. There are 215 steps reaching down towards Lapa covered in over 2000 tiles found on constructions sites around Rio and also donated by people around the globe. The artist, Jorge Selaron described it as an evolving piece, changing as you move through it. The buzz in this part of Rio was one of our favourites and the bold yellow and red tiles are consuming. Some of the tiles are also hand painted by the artist and other people around the world so like The Kiss of Freedom in Barcelona, you will be mesmerised for hours. This was one one of our most out of this word days we have ever experienced. We had read that to get to know part of the real Brazil you needed to experience a favela. Now, as it is highly discouraged to enter a favela alone, so we contacted Be a Local as they offered walking experiences through Rocinha, the largest favela in Rio de Janeiro and actually the whole of Brazil. There are drive by tours you can book, however, we wanted to really see it and the only way to do that is be in it. So off we went. We will be releasing a whole post on our experience of Rocinha and the history behind it, however, we can truly say it is one of the most amazing, terrifying and jarring experiences we have ever had. We put ourselves into a situation where we I don’t think we really understood the potential consequences. We weren’t going on a jolly to a simulated experience but into the heart of the dangerous undertones of the city. Our experience resulted in no real threat just intimidation. Looking back on our decision to go, we should have thought about it harder and weighed up whether it was in fact worth the risk but us being us we would do it again in a heartbeat. A favela tour is not for everyone, our dad would have hated the whole experience, being completely out of control, but, if you do want to see where a huge proportion of Brazilian people live and what their daily lives entail then this is an absolute must do. We also have to say that Be a Local were absolutely amazing throughout the whole experience and it wouldn’t have been the same without their strong relationships with the community and their professionalism. This was our last day in Rio at the beginning of our trip and the next big tick was to see Sugar Loaf Mountain. Unfortunately, the sun wasn’t shinning for us on this day but we’d had three glorious days of back to back sunshine, so we were due a hiccup. As we were staying on Copacabana we could walk to the end of the beach and there it was standing in all its glory. You have to take two separate cable cars up to Sugar loaf Mountain itself and half way there is a fantastic restaurant which luckily enough for us served caipirinhas. A great little lunch pitstop. Once you are at the top the views are amazing and we were up there on a day of low cloud fall. We can only imagine the views on a bluebird day! There are lots of different little allies you can wall along draped with vegetation. Due to the weather when we were up there it was like a magical wonderland with the clouds hanging amongst the trees and it also meant we almost had the whole mountain to ourselves. Of course, as we stepped back onto solid ground the clouds parted, and we had sunshine again. Just our luck. But instead of jumping back on the cable car we decided it was time to cheat on Copacabana Beach and try out Ipanema Beach. Now, we loved Copacabana and maybe yes due to the fact we sang ‘Copacabana’ by Barry Manilow for a whole month every time we spoke before we left. However, Ipanema Beach is the new, red Ferrari to Copacabana Beach’s old, vintage, white Porsche. It just has a little more summin’ summin’. The people are a little younger and a little louder, the vibe is a little more electric and inclusive. The caipirinhas are a little bigger and a little stronger. We stayed here still sunset, with the locals chatting and dancing to music around us. At the end the pink skies were beautiful with a scattering wispy cloud left from the storm before, slowly retreating behind the mountains in the distance and it was perfect. There could have been no better way to end our time in Rio and no better way to cement the fact we would return before heading back to the U.K.
After our stint in Rio de Janeiro we headed to Ihla Grande, Paraty and Sao Paulo where we were meant to be ending the trip, but after our time in Rio de Janeiro we couldn’t leave without seeing it one more time. 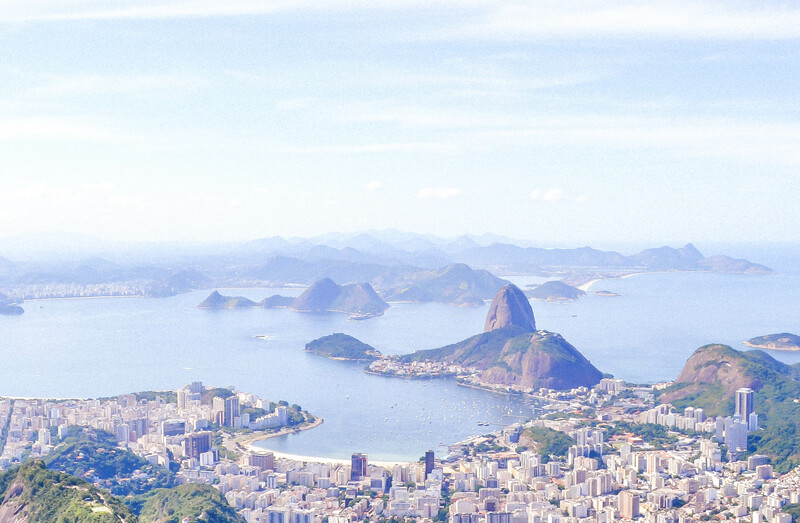 We flew from Sao Paulo straight back to Rio de Janeiro to soak up a little more. This time we stayed at Miramar Hotel by Windsor, again on Copacabana. We only had a day and we knew exactly how we wanted to spend our last day! Miramar Hotel by Windsor also had a beautiful roof top pool with, again, stunning views of the city, but unlike our first day we felt comfortable knowing where we loved and what we wanted to do. In the morning we to a quick detour into Leblon, a more up market and middle-class area of the city north of Ipanema Beach. We wandered around the shops and stumbled upon a sushi chain Koni where we grabbed a quick bit to eat (which was delicious and highly recommendable) before heading back to the main event of the day, Ipanema Beach. We, as full on embarrassing tourists, purchased our Brazilian flag sarongs and went and placed ourselves in the middle of the party. It was a Saturday and all the locals were out in force wearing their sassy thong bikinis and their coolers full of drinks by their side. We had been slightly less prepared on the drinks side but no fear the caipirinha man was here! There are a number of caipirinha vendors who walk up and down the beach selling drinks. Some run off and get the drink from other places, but one sat on the sand with you, had a chat and crushed those limes right in front of your eyes! This was our man. He made us one and we were sold. Our day was panning out exactly how we wanted it to. Now, one little glitch in the system was the regularity at which our caipirinha man walked past. Ipanema is a long beach, but he must have been hitting that sand because when the sun started saying its goodbyes we were well and truly bungalow-ed. As were most locals around us too to be fair. After knocking our last pints of caipirinha all over our touristy flag throws we decided we should stop giving the British a bad name and head on back to the hotel. In vain that morning we had said that this was going to be the night that we take Lapa by storm and party till the sun came up, but alas we couldn’t even make it till the sun went down. Oh well, we prefer day time drinking anyway and we wouldn’t have changed that day for the world. When we were at university, at the end of the night out there could have been no better sight than the golden arches glowing in the distance. 20 chicken nuggets for Camilla and a Big Mac for Natalie is the standard order. We weren’t greeted by the golden arches this time but something entirely better, gagged writing and a red roof shining on top, you guessed it, Pizza Hut. We avoid these chains like the plague normally when were away, apart from another quite hungover day in Lisbon, but it was calling our names and with empty bellies and hazy eyes it was a great shout. Finishing our trip to Brazil in Pizza Hut was far from ideal but looking back we wouldn’t have changed it for the world. Trying to work out the drinks machine while carrying a slice of pizza around will be a little story which we laugh at forever. Brazil is an incredible country and Rio de Janeiro is an incredible city! We loved our time here and will be back again, even if the caipirinha’s eventually kill us.